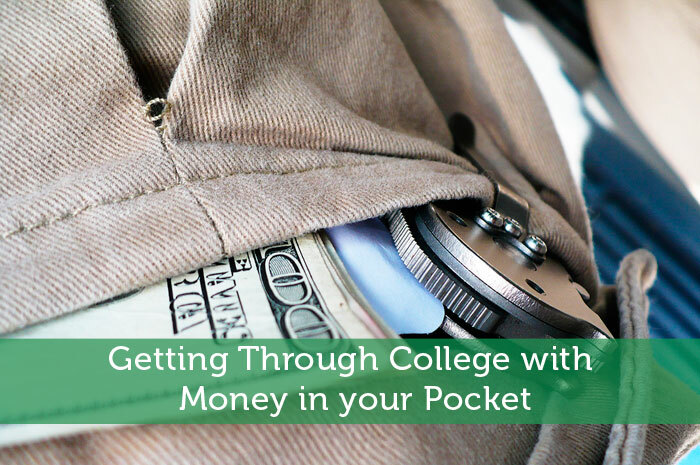 When a student starts thinking about college, most do not think about their expenses of making it through. Getting in was the easy part. The classes, while difficult, are easy when compared to the biggest reason people do not finish their degrees or even make it to the first day of classes: they cannot afford it. When compared to their parents, students today have the obstacle of increased tuition rates. Moreover, unlike the past, students with part-time jobs—some even working full-time—are unable to cover school costs. So what is a student to do? Is the dream of putting yourself through college even possible anymore? The answer is yes, but it comes with a caveat. The caveat being that while possible it involves hard work. The most obvious way to put yourself through school is to apply for financial aid, grants and scholarships. There is a multitude of scholarships and grants available to students across the nation. Grants and scholarships are great because you do not have to pay them back. The key is to find them and apply for them early. Do not wait until the summer before classes start, for that is too late. Financial aid will help you pay some of your tuition and other bills, but do not forget that you will need to pay them back at some point so do not just depend on financial aid. Yes, you need to focus on your studies, but you also need to ensure you do not saddle yourself with a huge debt the moment you leave college. If anything, you need to try to build your credit (Adam from ModestMoney.com discusses how in this article) while in school. Concentrating on your studies is difficult enough, and having to juggle that with a part-time job is only more so. Your grade might suffer some because your focus is not always on your coursework; however, at the end of the day, companies do not pay attention to what your first-year psychology grades were. To be sure, work is not always easy to find; looking for work can sometimes feel like a full-time job, but every little bit helps. Yes, college is about independence as much as it is about working towards your degree. If possible, students should live at home as long as possible. Of course, if you have are going to an out of town college that might not be feasible. In that case, you should be looking at off-campus housing. Off-campus housing is substantially cheaper than staying in a dorm. Furthermore, while meal plans are convenient, you should consider buying and cooking your meals. Just because you have money in the bank does not mean you can just spend it willfully. This is particularly true when you receive a lump sum from financial aid or grants. You need to budget your money and allocate it properly, so your money lasts until the end of the term. Smartphones and the internet are awash in financial apps that will help you do just that. At the very least you should use spreadsheet software to list your income and your potential expenses so you can plan properly. As time goes by, you will accumulate things like textbooks, equipment, and other supplies, many of which you may never use again. Declutter yourself by selling the items you will not be using again. If you are unsure how to proceed, you should look online and check out websites like Valorebooks.com that offer guides on how to sell textbooks. If you want to have any hope of putting yourself through college, you need to have one thing about all else: discipline. With a willingness to follow through on your plans and the discipline to do so, you will succeed. Not only will you end up with a degree and a chance to find your dream job, you will have learned how to live your life with financial responsibility. Getting a job is a great tip for college students; especially a part-time, on-campus job. Usually campus employers will work around student’s schedules and can be a great reference for students once they graduate. Most students like me think that #1 is your only option and collect loads of debt while using their part-time job for food and entertainment. That’s why I love how the internet is full of information such as this to educate parents and students of other options to skip or lower student loan debt while in college. Applying for a scholarship would be the best option for me. When my younger sister went to college, she applied for a scholarship thankfully she got approved. Agree with all of your reasons to opt out of a smartphone and I’m perfectly content with my flip phone. BUT…I’m in the market for a new (compact) camera and Smartphone cameras are real contenders considering their capabilities. Best of all I can have a camera “at the ready”, all the time vs having to make a point of packing and carrying a separate device in case I want to take pics. On the other hand I’m not about to pay for an expensive data plan just for the convenience of the built-in camera in the smartphone. So…unless someone can suggest another alternative I guess I’ll start shopping for a compact digital camera. And keep the flip phone that has served me well. By the way, my ipad has a great camera but it’t too cumbersome to take Long for snapshots. Frugality has proven to me, to be one of the most important practices a person can take up and perfect. Not because I was born rich, inherited money, or even came from a family with money – I was able to retire when I was in my 30’s, because I sacrificed much of life while I was/am young, so that I don’t have to be worried about finances as I get older. Most young folks can’t do this and it baffles me. Life is short, life is supposed to be fun… That’s what they echo. To each his own and if that makes you happy, then that’s just fine and dandy. However, there is a balance between living life to the fullest and having a blast while doing it, and preparing the rest of your life to have it easier than those around you. There’s always a compromise to be made. Try giving frugality a chance. It’ll pay you back more than you ever paid into doing it. Those are sad statistics to see about credit card debt! Once you learn how to work credit cards to your advantage it does pay you though! Only for those with the willpower not to rack up debt and pay it off each month. If you have a business, or are starting a business, your returns should be far greater than anything that you can get in the stock market. I saw this a lot when I worked for a financial advisor. We had a terrible time convincing business owners to invest, buy whole life insurance, or put their money anywhere other than their business. Their rationale was, “I can get 20% return on my money investing in my business, why would I opt for 10% investing it?” Can’t argue with that. Savings is so very important in todays economy. An emergency fund should be at top of everyone’s list. You never know when something catastrophic is going to happen to you or your family. I have always told my friends that you should have money set aside for those times when things get tough. I lost my job and my family all in one years time, I know what it is like to be financially devastated. I learnt the hard way of how to get financially independent and I love your post showing people how to save. Anyone with high interest credit card debt shouldn’t have more than $1,000 in their savings account imo.